If your Barbie doll doesn't have a Sunday dress among her doll clothes, now is the perfect time to do something about it. In fact, it will prove to be one of your most cherished pieces of Barbie doll clothes. As you can tell the design on this dress is quite simple, but the look is still remarkable to say the least. Before you begin this dress, you need to find the perfect fabric, and it will need to be something truly special, especially since it is a high-class design. Think about the ladies wearing their dresses in church on Sunday. You can think about the high quality fabrics that they are made of and that is what you will want to bring to this dress. You can certainly choose from a number of styles, a simple cotton material or even polyester would be nice. Because the Town & Country dress doesn't normally come in silk and sheen materials, if you are looking for realism, these might be choices to avoid. When you are sewing together this dress, pay close attention to how the dress will fit your Barbie doll. You may want to make some adjustments in the length, depending on the scene you will have her wearing it. In some cases, you might choose to lengthen or reduce the sleeves to create a more personalized look. Some great color choices for this dress would be a grey or even cream color. If you want a stunning dress, you could even consider going with a deep rose red. Depending on which color you do choose, make sure her Sunday best accessories match well with it. These will help the design to stand out, and create more interest in those who are looking over your set. Because this pattern is simple, you might consider making a series of them at the same time. Using different fabrics until you find the one that is perfect for your Barbie doll. Since doll clothes can be expensive to buy retail, these free Barbie doll clothes can give you an inexpensive and fashionable way to express your doll. Finally, take pride in what you are doing. 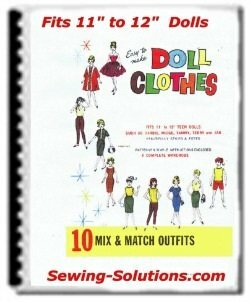 Each dress you sew will be a part of you and it will help to create the perfect look for your doll. 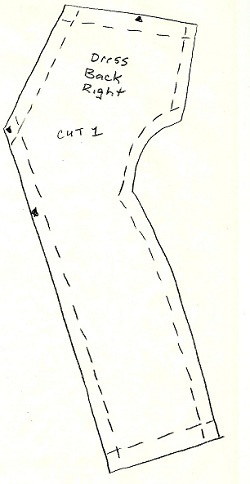 Layout dress pattern pieces and cut as follows. Cut 1 dress front, 1 dress back right, 1 dress back left and 1 each of the facing pieces. 2 – Sew facing pieces together, again matching notches. 3 - With “RIGHT” sides together, attach facing to neck edge matching seams to center back and center front. 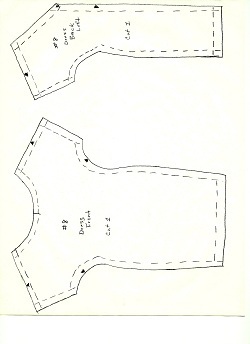 4 – Join front dress to back dress and sew entire under arm seams. 5 – With “Right” sides facing sew up back left to right.